Billy Harrow is an ordinary squidologist working in the Natural History Museum in London when their giant squid vanishes. Before he knows what is happening Billy is being hunted through London by a whole range of cults, people with magical powers and some of the most evil assassins known to humanity who all believe, erroneously, that he is some sort of squidly messiah. The book begins with Billy simultaneously trying to stay alive while working out what on earth is going on in this new side of London he has never seen before. Who is trying to help him? Who is trying to use him? Who is trying to kill him? And will he work it out before the end of the world which is, it seems, imminent. Oh, and also, where did the squid go? If you are able to suspend your disbelief there are some great characters in the book. The impossibly evil and psychotic Goss and Subby are assassins with gruesome magical abilities who travel through history leaving a trail of mutilated corpses in their wake and in the employ of someone known only as Tattoo. Tattoo, it turns out, is an evil ganglord who is trapped in a tattoo on the back of a poor chap called Paul, but who still manages to run an evil empire. They are all after Billy. On Billy’s side are Dane, the intense and capable Kraken worshipper, who leaves his cult to rescue Billy, the charmingly incompetent magical branch of the metropolitan police, a being called Wati who lives only in statues or dolls but is also a union activist and, finally, Billy has the unreliable aid of a memory angel, whatever that is. The way magic is introduced in the book is really interesting. There doesn’t seem to be any ‘science’ of magic in this version on London. Different people are just described as having different ‘knacks’ for doing things. For me, this is a bit of a shame as I think what often makes these books interesting is seeing what people do when they reach the limits of where magic will take them. But there is a brilliantly blurry boundary in the book between people who have these ‘knacks’, normal people who just like being in cults, and the fading gods who, apparently, hang about London. All in all this was a really interesting read, if you like this sort of thing. The vision of London that Mieville conjures is really vivid and intriguing and the plot twists and turns. For me, the book was maybe about 100 pages too long, as at times there were plot twists which didn’t really add anything, but overall I really enjoyed it. A lot of the writing felt very filmic and it would be interesting to see if they did make a film of it as I think it would be brilliant. If you like books like Neverwhere, you will probably really enjoy this one. 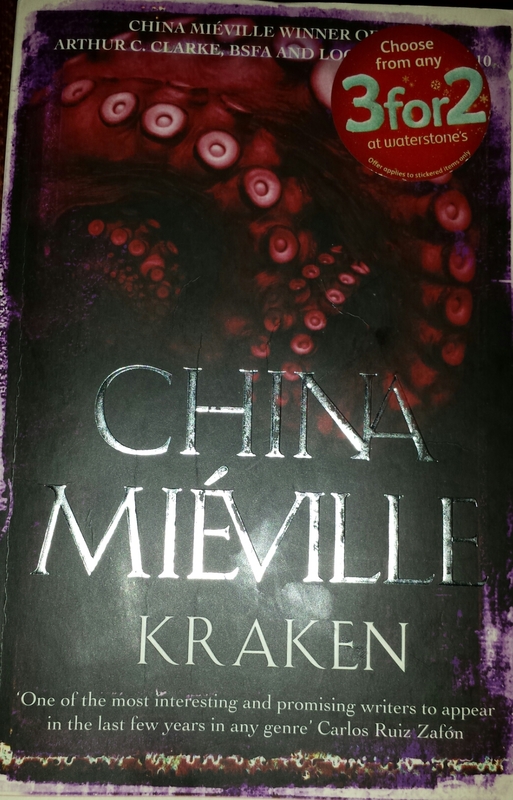 Tags: apocalypse, book, book review, books, China Mieville, Fantasy, Kraken, London. Bookmark the permalink.